It isn’t every day you get to see a super group, even if, according to Wiki, there are hundreds of them, each one a household name of course. I only ever saw one, namely Emerson, Lake and Palmer, a genuine case I would venture. But here’s another one, and it is gratifying that ShadowParty, even though it could be argued they merit the epithet, don’t take themselves too seriously, on the basis that they are a band “united by a fairly unusual circumstance – each member is a latter-day addition to a huge band…and they’ve combined as synth-pop’s answer to ‘The Avengers’”. They sort of “shadow” two main bands like the Shadow Chancellor does with Spreadsheet Phil, staying out of the limelight. Those bands are Ohio’s Devo and Manchester’s very own New Order. The group formed when guitarist Josh Hager and bassist Tom Chapman, a one-time Manc and lured there by the music scene, and who subsequently moved to the U.S. for family reasons, met in Boston, Massachusetts. Hagar is currently playing guitar and keyboards in Devo. Chapman is the former bass player of Bad Lieutenant who followed front man Bernard Sumner to New Order in 2011 when the band reunited for a series of charity gigs, replacing Peter Hook, no mean feat. Completing the group are Phil Cunningham, Marion founder member and New Order’s guitarist since 2002, and drummer Jeff Friedl, who plays for Devo. They put together a self-titled album on the Muse label last year with Denise Johnson (Primal Scream; A Certain Ratio) and The Verve’s guitarist Nick McCabe and have been on the circuit for a year or more. Nevertheless they’d passed me by, but I’m not really surprised. There are or have been several bands doing the rounds in Manchester which are comprised of fringe or even full members of famous local bands from previous decades. I got to know one of them quite well a couple of years ago. I won’t name them but they are, like ShadowParty, top notch musicians. But they get little airplay or exposure, even locally. I get the feeling that the city has moved on and such bands are regarded now as a curiosity. Looking around the audience at Night People (which is now home to the legendary Twisted Wheel soul nightclub) convinced me. There were few people from outside a certain age range. The album is described as ‘synth-pop’ and I suppose it is but that isn’t what came across to me on a live platform. It was a guitar-sound principally and keys seemed to be mixed well down unless it was just a matter of where I was stood. You certainly couldn’t say you’re watching New Order, but at the same time there’s nothing remotely similar to Devo’s ‘Whip It’ either, possibly their best known song. Devo were also known for discordance, obscure time signatures and their propensity to arcane live shows but there was none of that either and the music took precedence over chats with the audience. 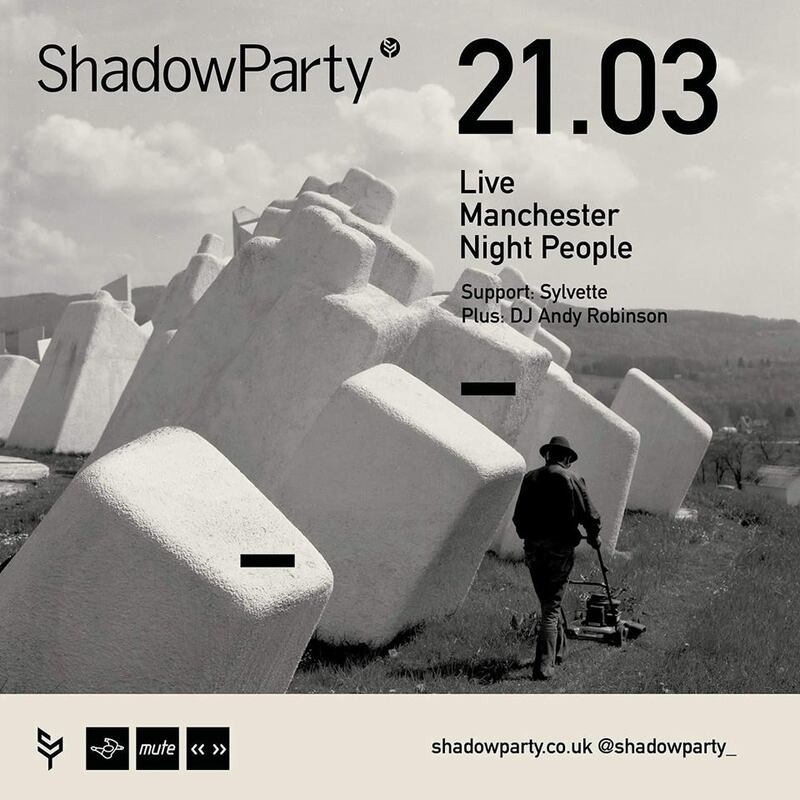 ShadowParty don’t ‘nod to’ either New Order or Devo in my humble opinion. Don’t expect ‘Blue Monday’, never mind ‘Whip It’. What they amount to is a good old-fashioned transatlantic soft rock band with powerful but not too demanding songs that are guaranteed to get your feet moving. Josh Hagar, who talks in American and sings in English, is a very competent vocalist. I’ve seen them compared to Coldplay and that has some merit; perhaps Coldplay-lite. The set was a little slow to get going, perhaps it was a case of ‘home city’ nerves for some of the members but it was instantly enlivened by the arrival of Denise Johnson about six songs in, after which she made a reappearance later. I’d go so far as to say she should be a permanent ‘member’, at least on stage. They left what is probably their most memorable track to date, ‘Celebrate’ until last. ShadowParty put on an entertaining performance and are well worth making the effort to see but the passage of time transpires against them. A couple of decades ago their songs would have been part of a ‘scene’ that no longer really exists and hence in much greater demand. But a diminishing audience can still appreciate their skills and the memories they evoke. Support bands can be hit or miss but Manchester’s five-piece Sylvette were a revelation. Billed as an ‘alternative rock’ band they are more experimental than that tag suggests and the violin work in particular stood out. Well worth checking out.